With a dash of drama and charm in the kitchen and bathrooms, this project in inner-city Sydney captures the clients’ personalities. The kitchen of this inner-city terrace house has a charming character, reflective of the clients’ personalities. 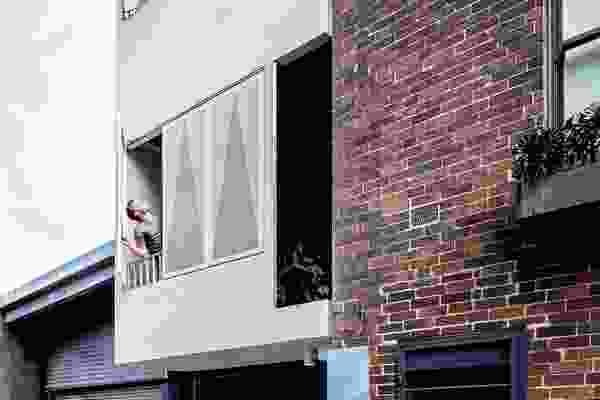 The long, thin terrace house site is always a design challenge due to the difficulties in capturing natural light and fresh air. 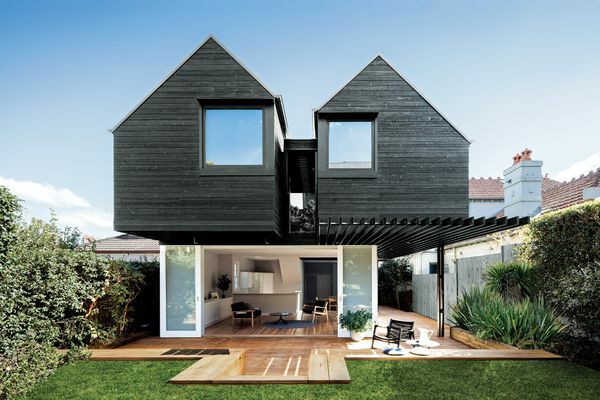 In the case of this project by Mac-Interactive Architects, the original terrace house was located at the end of the street and adjacent to a small park, giving the architect some room to move. With timber-clad folding geometry, the new house stands apart from its neighbours and avoids being a “tube for living” on the request of the client. A key aspect of the project’s brief was the delineation of the space into two living spaces – an active space for entertaining and a passive space to enjoy entertainment such as video games and movies. A single joinery unit was designed to cater to both needs, separated by a powder room and laundry under the stairwell to the upper level. On one side this joinery piece is the kitchen, while on the other it houses the television, gaming consoles and other audiovisual equipment. It also forms the stairwell to the upper level. The two primary living areas – passive and active – are strategically separated by this element. 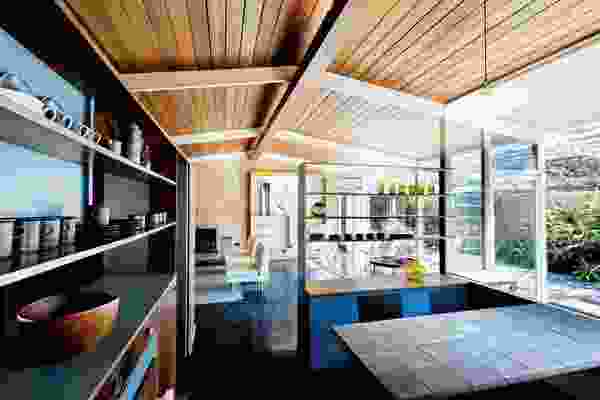 The kitchen side, or the active social side, completely opens onto the garden, with clerestory lighting creating a sense of volume. The use of glossy joinery in the kitchen also adds to the sense of space by reflecting light and glimpses of the garden. 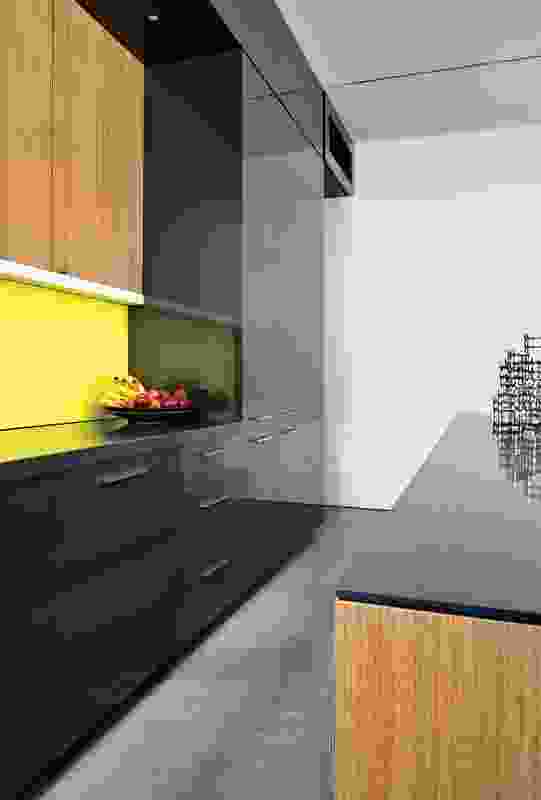 A bright splash of yellow cabinetry conceals all the appliances. With the kitchen appliances hidden away, it is the clients’ varied collection of art and artefacts that is featured on a series of nooks and shelves within the kitchen joinery. 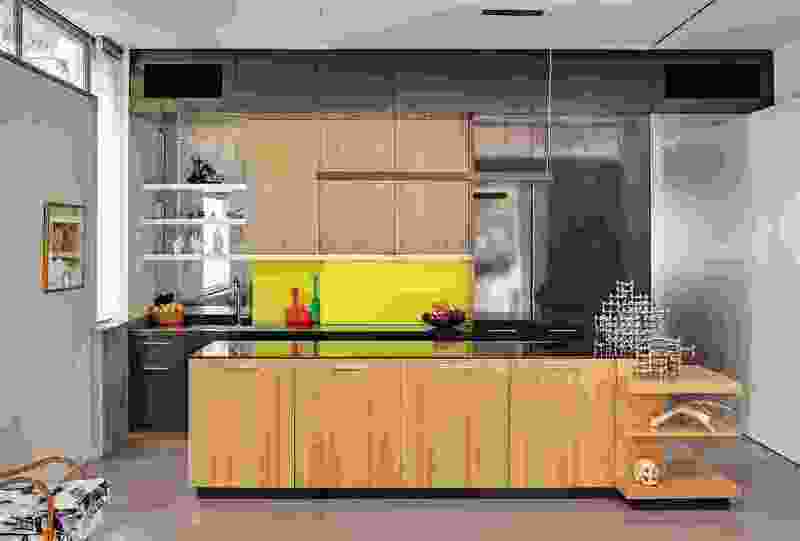 These design details give the kitchen a charming character, successfully reflecting the clients’ respective personalities. 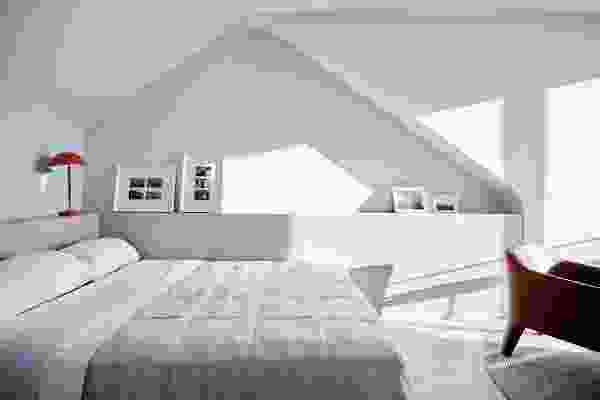 Throughout the home, the colours and materials – timber, concrete and white-painted plasterboard – are subdued. 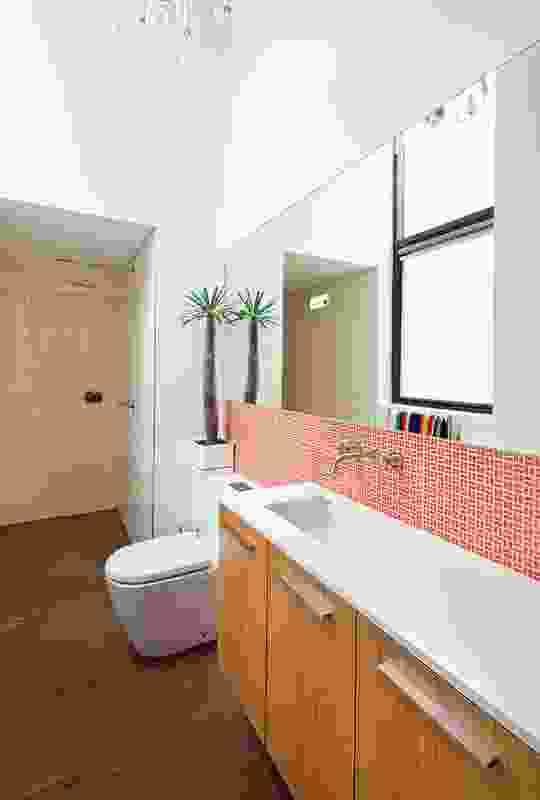 The bathrooms diverge from this subtlety, employing a vibrancy of colour and texture. 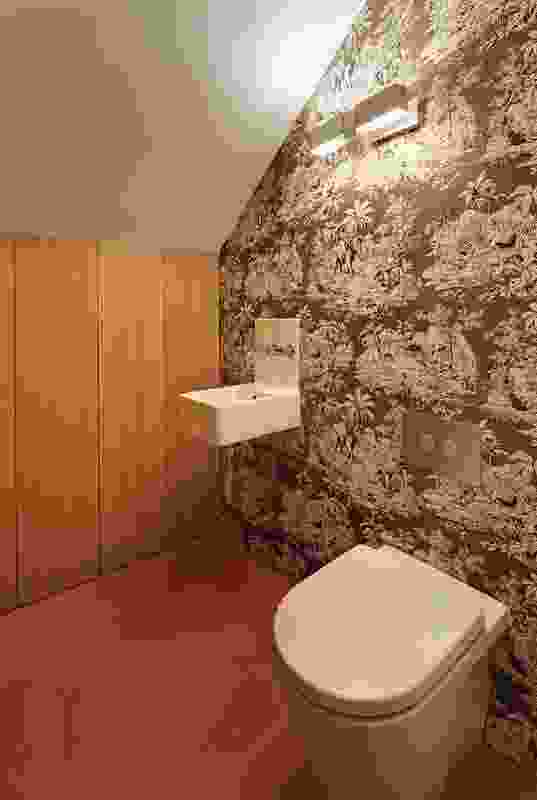 Unconventional materials were explored – for example, the use of a floor tile in the ensuite that looks like timber and a wall of ornately decorated wallpaper in the powder room. In particular, the architects took the opportunity to add a dash of drama in the ensuite – the high ceilings allowed for the placement of one of the clients’ chandeliers in this room. Although the room is very narrow, the design solution gives it a sense of ample space. The bathrooms are given as much, if not more, attention to detail as the rest of the house, demonstrating a holistic approach to residential design. Burnished concrete; rugs; blackbutt-stained timber. Raven CaesarStone; laminate and veneers doors Lamitech/New Age veneers; Barben handles. Cubo square tub sink; Gessi Oxygene sink mixer. Miele dishwasher, oven, cooktop; Fisher and Paykel refrigerator/freezer. Manuel Canovas’ Bengale wallpaper (in powder room); Gloss Ivory wall tiles supplied by On-Site (in main bathroom); Disco Mosaic Lime wall tiles (in main bathroom); Bisanna ‘Orange Seed’ and ‘Gloss Ivory’ wall tiles (in ensuite). Orange Activa rubber (in powder room); Petra Structured Dier supplied by On-Site (in main bathroom); Eco Wenge timber tile ‘Ocean & Merchant’ (in ensuite). Avent taps (in powder room); Posh Bristol chrome taps (in main bathroom and ensuite); Nikles Techno 250 shower head (in ensuite). Ideal Standard ‘White’ wall basin (in powder room); Kado Arc 230 undercounter basin (in main bathroom); Kado Arc 430 undercounter basin (in ensuite); Ideal Standard Acacia back-to-wall toilet pan. 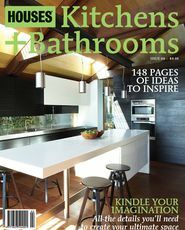 The palette of materials in the kitchen is varied in order to give texture and interest to the space. There is a sense of drama in the ensuite thanks to a chandelier placed in the tall volume. The powder room features a nineteenth- century pattern printed on gold wallpaper. 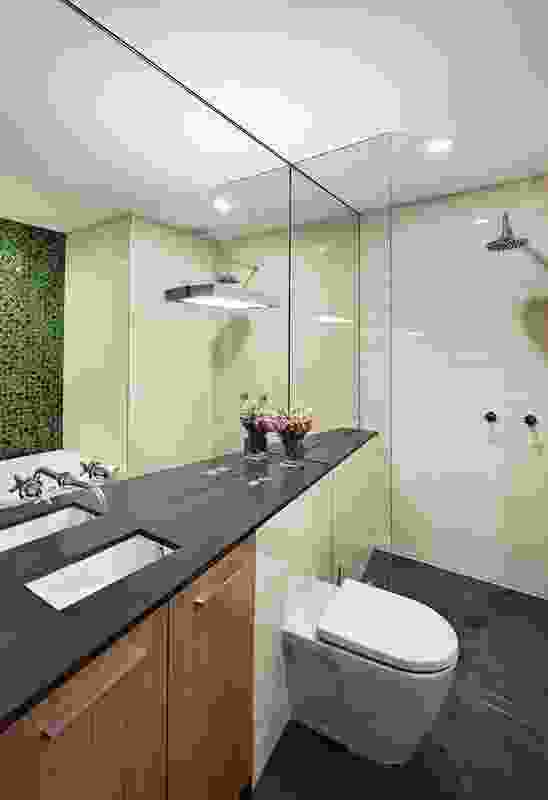 The main bathroom includes a feature wall of green mosaic tiles. 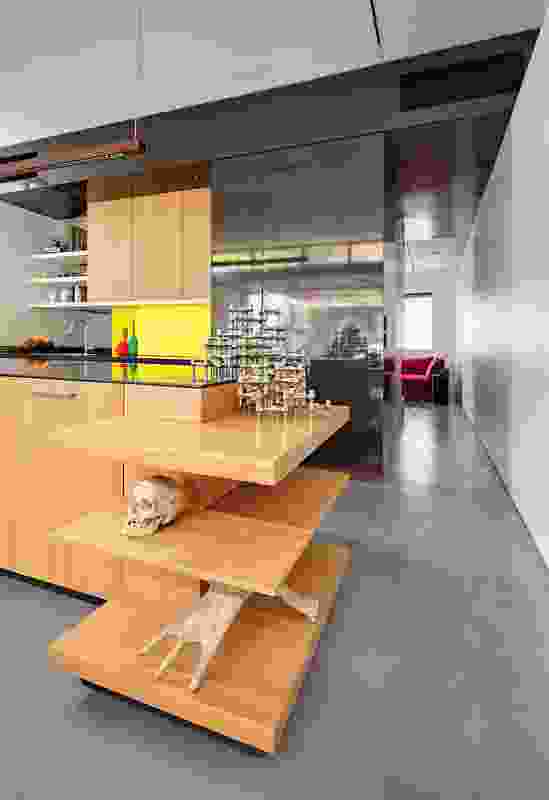 The kitchen joinery unit is designed to display the clients’ varied collections of art and artefacts.